The China-funded port city project in Colombo was going ahead, a top Chinese official from the company executing it said Wednesday, days after the new Sri Lankan government claimed the deal was still being assessed. Prime Minister Ranil Wickremesinghe had told the Sri Lankan Parliament last week that the agreement was under assessment, contradicting cabinet spokesperson and health minister Rajitha Senaratne. Just a day before the PM’s statement, Senaratne told reporters in Colombo that the $1.34 billion agreement to reclaim land and build apartments and malls had got the green-signal. According to Zhang Baozhong, vice-president of the China Communication Construction Limited (CCCL), the project, in fact, was very much on. “For sure,” Zhang said when asked about the status of the project by reporters on Wednesday. Zhang was in Quanzhou in south China to attend an international seminar on the 21st-Century Maritime Silk Road (MSR) initiative taken by President Xi Jinping. “It is already approved,” Zhang added when questioned about environmental concerns related to the project. The project, located near Colombo’s iconic Galle Face beachfront, was inaugurated by Xi when he visited Sri Lanka last September. The status of the project would likely be on the agenda when President Maithripala Sirisena visits New Delhi next week, the Hindustan Times reported. China’s rising investments and influence in Sri Lanka had left India worried in the last few years during President Mahinda Rajapaksa’s regime. But with Sirisena coming to power, and following his statements about India being the focus of Colombo’s foreign policy, it had seemed that the diplomatic tide could be turning against Beijing. But the ongoing flip-flop on the project is likely to send confusing signals to New Delhi, which will be closely following Lankan foreign minister Mangala Samaraweera’s visit to Beijing later this month. Zhang said the project will generate employment for 83000 people – all of them locals. “There were some criticisms and doubts (about the project). This project is aligned development goals of Sri Lanka. We have very good relations with President Maithripala Sirisena,” he said. On concerns about damaging the environment, he said: “We focus a lot on environmental protection. For marine projects, we have very strict standards about purity of water body. We have 24 sentinel stations. If there is any influence on water quality, we will change implementation plans”. Giving details about the project, Zhang said it will cover an area of more than 5.2 million sq metres building area with capacity for 160,000 people. Last week, visiting Chinese assistant foreign minister, Liu Jianchao, had said the plan, and another port project in the south, were good for Sri Lanka. “(We) believe that the new Sri Lankan government will act upon the basic interests of Sino-Sri Lanka friendship and national development to ensure important cooperation projects do not experience ups and downs because of changes in the political situation,” he was quoted as saying by the foreign ministry in Beijing. Looking at the picture in this news item, I dread the transportation problems that will arise when this city is commissioned. Even now, reaching Galle face Green for a leisurly walk in the evenning, using public transport, is almost impossible. A friend lost a limb in a minor accident while travelling in a bus last month. 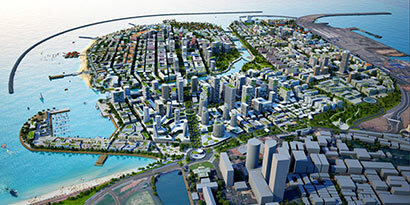 The Chinese will build this city, its buildings and roads and Colombo’s jet-set will enjoy the precinct consuming Rs200 per piece hoppers, while the amude-wearing taxpayers will bear the brunt of the loan repayments to the Chinese at double international interest rates.